Air France’s premium economy cabin is much like a regional business class, offering exceptionally good beverages, noise cancelling headphones and major fast track benefits, identical to those for business class customers in terms of luggage, security and priority boarding. Seat Dimensions: 19” Seat Width x 40” Pitch (Legroom). On Board Features: Extra Large TV. Reclining Shell Seat. Amenity Kit. Power Ports: Yes. Stay Charged Up. Separate Check In? Yes, SkyPriority Fast Track. Baggage Allowance: 2 Checked Bags. 2 Carry Ons. Lounge Access? For A Fee. $25-$35, Depending On Country. What About The Food? Different And Better Than Economy. Priority Baggage? Yes. Time = Saved. Air New Zealand ditched their innovative Space Seat, but continue to shine with inspired food, leading Australia and New Zealand wines and priority access – ensuring a speedy journey upon landing. Since virtually all flights to and from New Zealand are long, this is a worthy expenditure. Seat Dimensions: 19” Seat Width. 43″ Seat Pitch (Legroom). On Board Features: Extra Cushion. Leg Support. Amenity Kit. Separate Check In? Yes. Dedicated Premium Economy Desk. Champagne? Yep, And Good Wine. Priority Baggage? Yes, Time = Saved. Japan Airlines offers an incredibly comprehensive, value packed premium economy experience. The seats are amongst the most spacious, airport lounge access is incredible and the food program is designed from inspired Japanese cuisine. It’s hard to use the word “economy” here. Seat Dimensions: 19” Seat Width. 42″ Seat Pitch (Legroom). On Board Features: Bespoke Design. XL Screen. Amenity Kit. Separate Check In? Yes, Dedicated Premium Economy Counter. Baggage Allowance: 2 Checked Bags. Lounge Access? Yes, When In Japan. Possible In Other Locations. Champagne? Yes. Gardet Brut, A Typical Business Class Champagne. Priority Baggage? Yes, Special Priority Tags. Time = Saved. When you’re flying for 15+ hours, every bit helps. Cathay’s premium economy seat isn’t the newest, but it’s among the very most comfortable. Add in a luxurious amenity kit, quiet cabin and some champagne and this is an excellent choice. Seat Dimensions: 19.5″ Seat Width. 39″ Seat Pitch (Legroom). On Board Features: Extra Padded Seat, Small Cabin. Amenity Kit. Separate Check In? Yes! Dedicated Premium Economy Check In. Baggage Allowance: 1 Checked Bag, 1 Carry On. Priority Baggage? Yes, Priority Tags. Offering one of the largest, most padded and most spacious seats in the premium economy category is an excellent start. From there, Qantas excels with their Neil Perry celebrity chef partnership, priority baggage and boarding. The storage space helps too..
Seat Dimensions: 19.5″ Seat Width. 42″ Seat Pitch (Legroom). On Board Features: Amenity Kit, Adjustable Head Rest, Extra Storage. Separate Check In? Yes, Dedicated Priority Check In. Baggage Allowance: One Checked Bag, One Carry On. What About The Food? Neil Perry’s Rockpool Grill Inspired Menu! Seat Dimensions: 19″ Seat Width. 39″ Seat Pitch (Legroom). On Board Features: Head, Leg And Foot Rests. Amenity Kit. Separate Check In? Yes, Dedicated Premium Economy Check In Area. Baggage Allowance: Two Checked Bags. Standard Carry On Policy. Lounge Access? Yes! In Most Major Cities. Priority Baggage? Yes, Priority Pick Up Service. First they give you the welcome bubbles, and then they hit you with an after dinner digestif or liqueur to send you off to sleep. Sold! Virgin’s generous baggage allowance, comfy seats and premium lanes make for a wonderful way to fly between the world and London! Seat Dimensions: 21″ Seat Width. 38″ Seat Pitch (Legroom). On Board Features: Adjustable Head And Foot Rests. Amenity Kit. Newspapers. Champagne? Sparkling Wine. Close Enough! And, After Dinner Liqueur. Priority Baggage? Yes, Priority Over Economy. Sometimes it’s the soft touches that make a difference – and Singapore Airlines is no exception. Their seat is a solid tie with other top carriers, but their exclusive service, book the cook food offerings, state of the art televisions and airport fast tracks are second to none. Seat Dimensions: 19.5″ Seat Width. 38″ Seat Pitch (Legroom). On Board Features: State Of The Art TV’s. Amenity Kit. Headphones. Champagne? Yes! And Singapore Slings! Woohoo. What About The Food? You Can Book The Cook, Meal From Extensive Menu. Priority Baggage? Yes, Priority Baggage Handling. Who else should be on the list?! 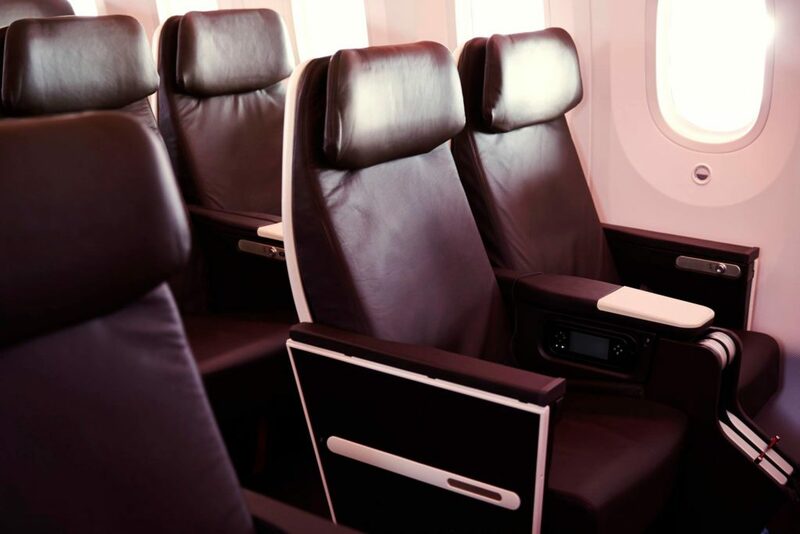 Comment below..
best premium economycomparison of premium economy amenitieswhat to expect from premium economy?which airlines have the best premium economy seats? So… in general, difference between premium economy and biz is lie flat seat? SAS also has an equivalent premium economy seat with better seats, food, fast track and even lounge access. I think also BA has a great PE product too. Excellent and super valuable post. You missed a few like American (new), Lufthansa, etc. but still an excellent post. LH premium economy is better than economic but not that better to be on this list. No champagne, no priority boarding nor check in. Baggage are treated like regular ecomony bags. There’s lounge access for a fee in certain airports. SAS has a very good Premium economy product with comfortable seats, free wifi, better food, lounge and fast track. thank you for not putting the crappy British Airway seats in there, they were extremely uncomfortable on both the 777-200 and the A380. China Airlines PE. pretty much the same as JAL. But honestly my best friend/s are Ambien/Xanax, are the better “Seat”, Prescribed by a licensed physician of course. Last december i was on CI PE, after the first meal i fell a sleep with a ice cream and the spoon still in my hands. best sleep on a flight ever. I second this – not crazy about the seats that slide forward rather than reclining (as seems the norm in PE) but it certainly made a 16+ hour flight a lot more pleasant. I have flew in the airfrance premium economy seat twice and I have to say that their seat is very good looking but it is the worst premium economy seat I have tried. The way it’s built is very uncomfortable with our body and back, and I’m not very tall. I’d rather pay economy and add a good menu in their website. The only positive thing is the sky priority before the flight. Otherwise, I was expecying to see Lufthansa premium economy, those seats are great ! British Airways is now a rubbish airline. Would not wish to ever travel with them again. Had a serious complaint last November, never resolved to my satisfaction. One of my complaints was my seat in premium economy (back breaking) had there been room I would have slept on the floor of the cabin! PE total waste of money! Have to concur with criticisms about BA. No dedicated check-in/priority boarding/baggage + power ports on 777-200 you need an adapter for UK?! Lastly no cooked breakfast – awful cold boxes. I use AF PE often. The food is the same as Economy, with a slightly better starter. That starter is the only difference in service between the classes. Champagne is served, as it is in Economy. The fixed shell seats are spacious, but they are renowned for how agonising they are to try and sleep in. They don’t recline at all, instead the seat slides forward and your back slides down. Economy is much more comfortable for a red eye because you can recline. This is the drinker’s list? Every airline listed here as having good Premium Economy offers complimentary champagne or sparkling wine. But the seats are all over the place, with most only 19″ wide (many Economy class seats are as wide or wider) and half having pitch of 38 or 39 inches… perhaps 20% more than a typical 32″ Economy seat. And for those for whom the seat comfort is not paramount, the difference between one and two included checked bags, the nature of the power delivered to the seat (some have circuit breakers that limit current to less than half an ampere, inadequate for a business laptop), all seem more important to determining whether the Premium Economy experience is truly Premium than whether you have to pay for a glass of wine. Perhaps a list which gave both objective (seat width / pitch) and subjective (while working, while eatiing, while sleeping) measures of the comfort of the seats, and showed the best dozen or so of those, supplemented with the other information about the facilities and perqs afforded to Premium passengers, would also be of interest to others besides me. I welcome you to start your own blog. I I gave you seat width, pitch, features, food, airport amenities. If you want more, you’ll have to start your own. I think many people are happy to learn whether or not champagne will be served. It’s part of the fun. True, I’m looking for a PE that gives me/us the most comfortable experience, bugger the champagne/a la carte menu, and the other fripperies, leg room and comfort, so who’s best for that? Gilbert – Is Norwegian PE worth mentioning? Any plans for a similar detailed review of the Air Canada PE seat? We will be flying on them from Sydney to Toronto next spring (using points).